Fauja Singh, believed to be the world’s oldest marathon runner, is up for a United Kingdom (UK) state medal of honour. He has been listed in UK’s New Year Honours lists for 2015 that recognise the achievements and service of extraordinary people across the United Kingdom. 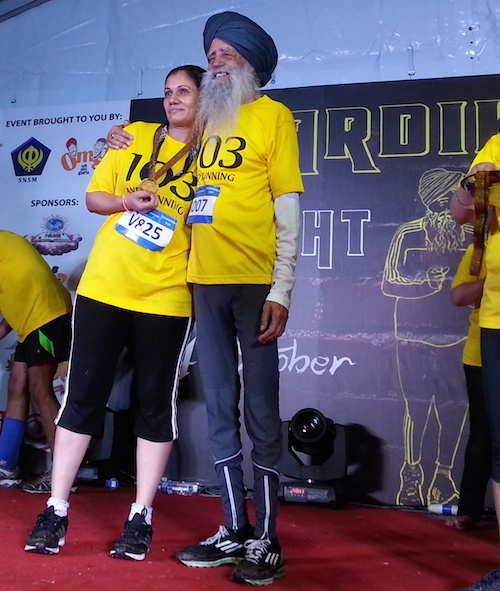 Fauja Singh presenting a medal to one of the winners at the Chardi Kala Night Run 2014 in Kuala Lumpur. The runner wore t-shorts bearing 103, his age at the time of the run. Fauja Singh last visited this region when he participated in the Chardi Kala Night Run in Kuala Lumpur in November 2014. He was then 103 years old. [See Asia Samachar report here]. At least six other Sikh names were seen in the UK list. They are Dr Mohinder Singh Ahluwalia and Bhai Sahib Mohander Singh for services to interfaith and community cohesion, Surat Singh Sangha (Managing Director, Asiana Ltd) for services to entrepreneurship, Gurmel Singh Kandola (Chief Executive, National Sikh Museum, Derby) for services to the community, Surinder Pal Singh Khurana for services to the community in North East Lincolnshire, and Surinder Kaur Ghura for services to interfaith understanding and to the community in Newcastle upon Tyne. Mrs Ghura is sole Sikh women in the list.